Huh! They did a Gewiss! Just watching it now. Why didn’t they duke it out in the end? They just let Museeuw have it. Did they just respect team hierarchy that much? They knew he was more doped than them and that they didn't have a chance. 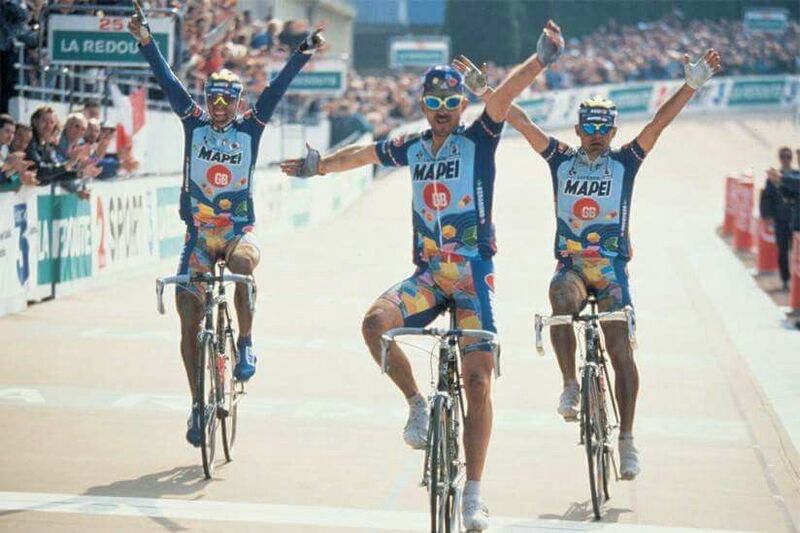 Leferve called up Giorgio Squinzi, head honcho at Mapei, and asked him who should win. The order was agreed, then Tafi, quite rightly, argued he should finish second. Sock length, saggy jerseys, no lids, juicing hard - glorious stuff. I mean that in I still have a certain nostalgia for the sport then. I didn’t know anyone was cheating because I was a kid and it was blissful. The raid was Austro German, the doping was international. "Germany, Austria, Italy, Sweden, Finland, Estonia, Croatia, Slovenia and Hawaii"
and that's just Team Sky. Possibly, we don't know for sure yet. But what we do know is that the organisers of this doping ring are from Germany and Austria. We know that the doping was international, unless you doubt the Staatsanwalt. The doctor is German; Kohl, Schuhmacher and Kopp have spoken about him in courts previously. Selon le récit fait au Monde par plusieurs sources, les trois représentants de l’AFLD ont demandé à Clémence Calvin de se soumettre à un contrôle antidopage inopiné. La Française aurait refusé et pris la fuite. Best female French marathon runner is asked to give a sample in Morocco. Runs away. Yeah she’d been evasive for a while so they caught her out in Morocco and she literally ran away in the street. Avoiding giving a sample is normally treated the same as a positive. So she's kinda fucked. She'll be running away for a long time, though. La Française aurait refusé et pris la fuite. ... which just means: 'The Frenchwoman refused and fled', but doesn't say how. The article also notes that there are different versions of the encounter and that they may be subject to a future legal battle. Why are you allowing linguistic ability and facts get in the way of a good tale? We voted to abolish facts in 2016, get on with it!